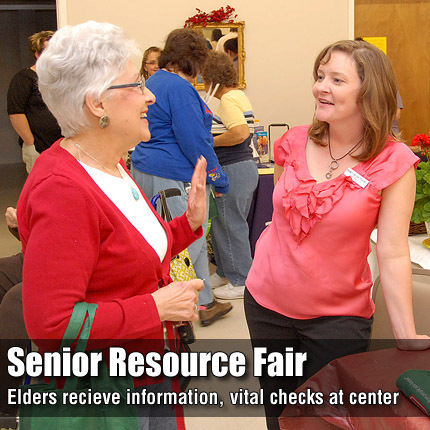 Area seniors gathered April 28 in Osage City for the fifth annual Senior Resource Fair at the Osage County Senior Center. Above, Darlene Rosetta, left, speaks with Mandy Gibson, of Gibson Truecare Pharmacy, about the services offered by the pharmacy. The fair also featured health checks, including blood pressure, vital signs, glucose levels, spinal screening, and stroke risk. Vendors educated the senior community about health, mind and body.